Every once in a while I’ll start asking myself about what I expect from new music. Should each record try to break new grounds, establish various paradigm shifts, or is it enough to want more of the same, more of the music that I’m comfortable listening to? 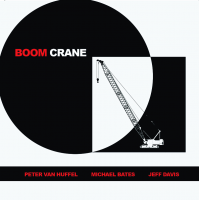 The great thing about albums such as Peter Van Huffel’s Boom Crane is that it brings a bit of both of those things to the table and makes me forget the question I was pondering over in the first place. It makes me just enjoy the great tunes. Boom Crane is a frolic record and a debut album that any band could wish for. The trio of Peter Van Huffel on alto saxophone and clarinet, Michael Bates on bass, and Jeff Davis on drums indulge in an incredibly joyful, powerful display of a multitude of styles within jazz whilst also adding touches of their own in the mix. Something old, something new, something unexpected, “Boom Crane” is, at its best, an incredible explosion of sound and expression sprinkled with many twists and surprises. The musicians build and drive their music with sudden tempo changes and weird time signatures, while also playing with the most diverse jazz idioms which, in turn, results in a fusion of epochs and forms, from post-bop to swing. This is not free jazz in the strictest sense, but it surely does feel liberated. It’s also an intense record, for sure, with the intensity not diminished by hints of groove and catchy melodies which seem to emerge now and again (“On Equilibrium”), nor by the bluesy patches on some tracks which evoke and conjure romantic and pensive atmospheres (“Boom Crane, “Talk to Me”). Slower and faster bits intertwine, between wild freak outs you sometimes find a calm, introspective bass solo. As you listen to the relentlessly urgent “Fast and Furious”, you just can’t help imagining Tom & Jerry chasing each other through a maze. It’s a studio record, even though it sounds so alive. The performance is so vivid that you can almost hear the imaginary audience clapping between song sections, interrupting the musicians, and lavishing them with praise. The trio might, at times, remind you of some other acts. A sentiment of humor and whimsy that fills the music ties them to Mostly Other People Do the Killing. On the other hand, the endeavor of trying to harness rock aesthetics inside of jazz, which threatens to explode and flow beyond its confines and boundaries, might lead you to think of Led Bib, The Lounge Lizards, or the The Bad Plus. To be clear, Peter Van Huffel’s trio doesn’t sound anything like those bands, but the attitude is similar. The musicianship is as top notch as the exhibited attitude. Finally, as is the case with most well made albums, all musicians enjoy an equal status: they are equally present in the mix, equally important in the sound, and even equally share writing credits. Even though Van Huffel’s saxophone might seem dominant in certain moments, it mostly comes down to its inherent sound characteristics. This is a balanced, well-rounded and exciting record with no serious flaws. In a nutshell: eleven great songs, about an hour in duration, make Boom Crane a thrilling and constantly good record that gets everything right and offers a pleasurable listen. A most pleasurable listen.